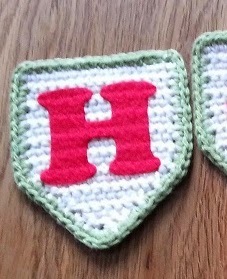 I LOVE these buntings, they are from Lucy at Attic24's pattern for Jolly Festive bunting. I absolutely adore the bright colours and how neat and pretty the flags are. They are made in Rico Creative cotton, cheap and cheerful (if a bit splitty) and very effective. 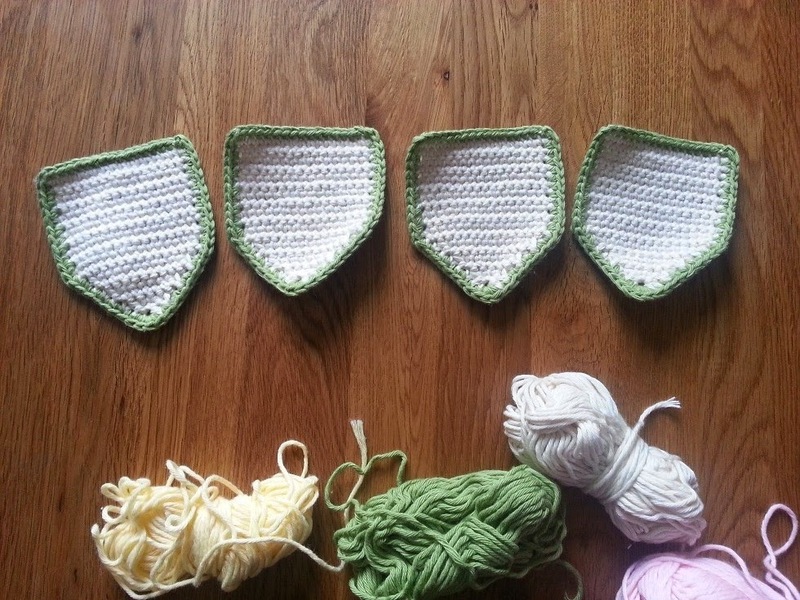 So this idea I had was to try making some bunting in sightly more muted colours. I am not one for pastels and usually prefer the brightest most vivid colours but I had a couple of balls of cream and this sage colour and I wanted to see what it would look like as bunting. Yesterday morning I started making the little flags and was very happy with how they were coming on. What should I put on the bunting though? 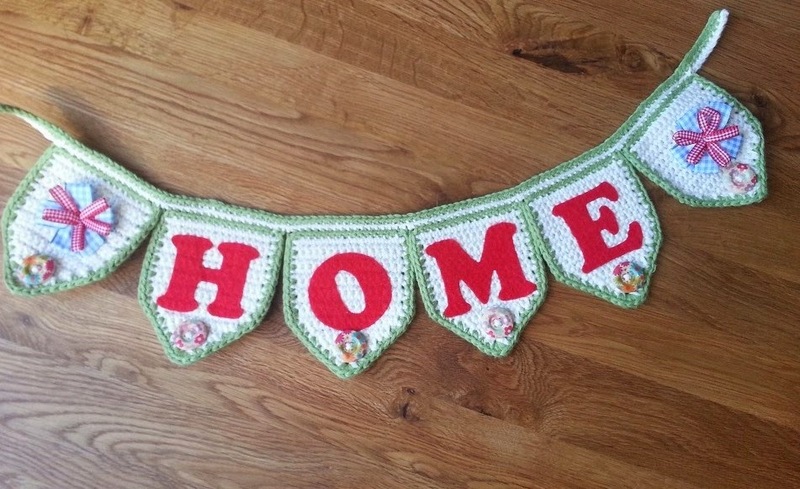 I considered doing a big long one that said 'Home Sweet Home' but that would mean 15 flags (one for each letter plus spaces) and I just didn't have enough cream yarn for that. 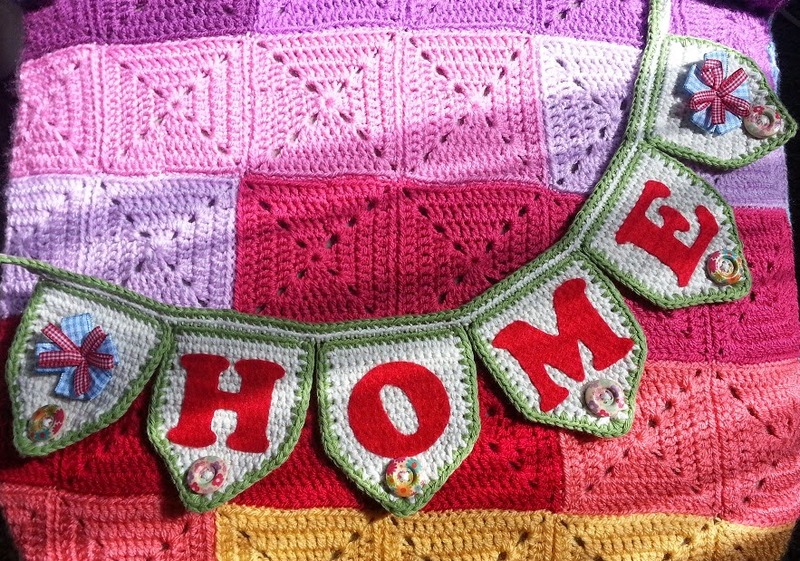 So I settled on one word 'Home' and a flag either side for decoration. I ummed and ahhed for a while on which colour to do the lettering in, as each flag was the same I wanted the letters to be the same too. Pastels weren't working as the letters didn't stand out enough, I considered a pale pink and then edging it in a neat row of white stitches to try to bring out the lettering but my hand sewing isn't really neat enough so I soon scrapped that idea. Red looked good and seemed like a nice homely colour, I could stop it looking too christmassy by adding some buttons and bits. The lettering is really easy to do, if a bit fiddly. Simply print out the letters you want off the computer but select to print a mirror image. Then trace that onto the paper side of a sheet of bondaweb. 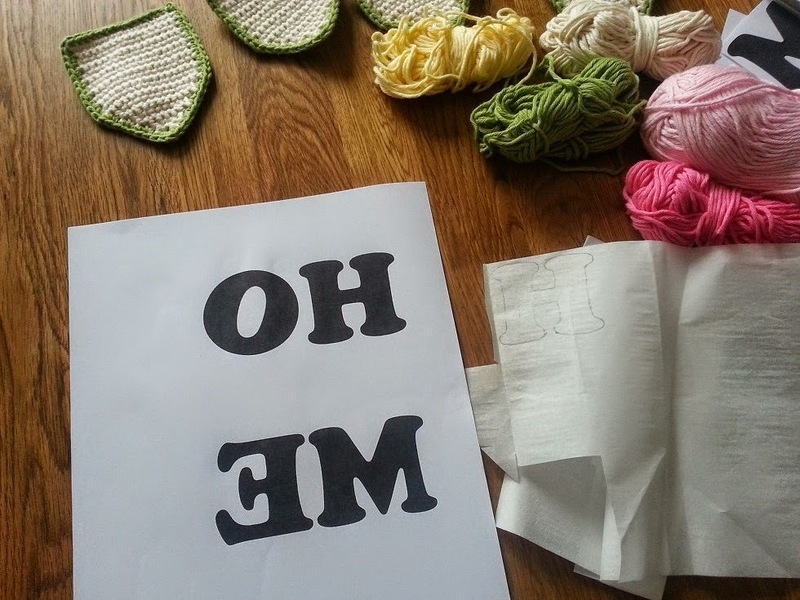 Dry iron that onto the felt, cut out the letters, peal off the paper and wet iron on to the bunting. At this point I could see how the bunting was going to look and I got that giddy, excited feeling that it was all going to work out beautifully! I picked up some cheap little wooden buttons the other day and they were just perfect for this so I popped one of these on the bottom of each flag. Nearly finished! Just needed to decide what to put on the flag at each end as decoration. I made some flowers, but the pastels just didn't stand out against the bright red lettering, and brighter colours clashed. 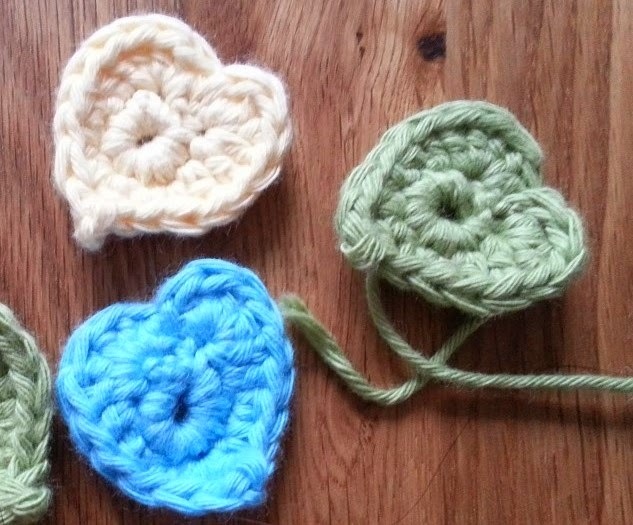 I made some hearts but they weren't right either. I spent an hour or two messing around, getting frustrated that I couldn't come up with something I liked. 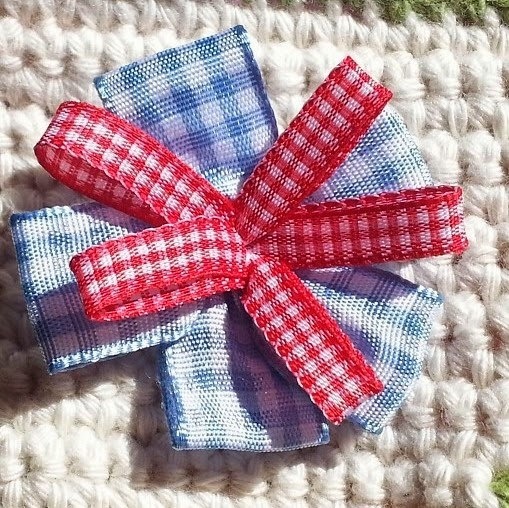 At a loss I had a rummage through my ribbon tin and found some blue and red gingham ribbons. Nothing says home like a bit of gingham right? 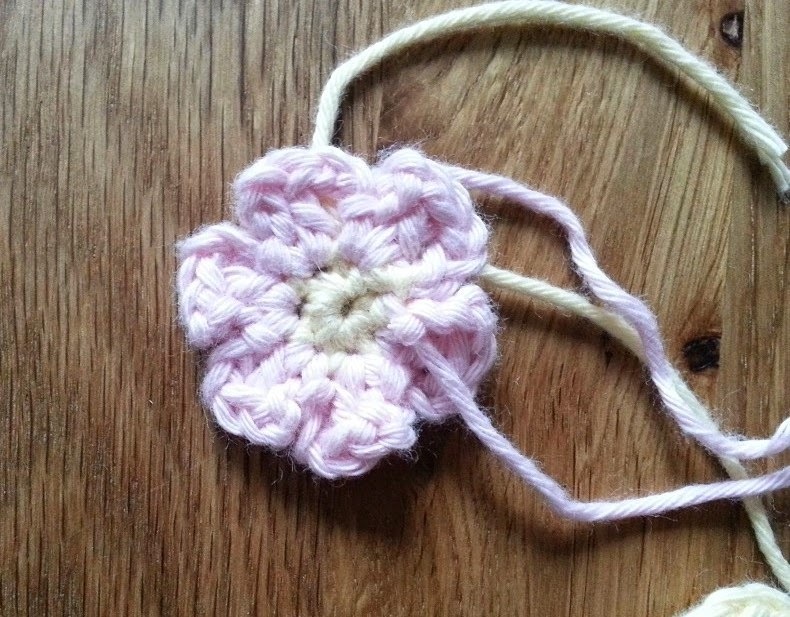 I sewed together little two inch pieces of ribbon to make flowery bow things, aww sweet! I think the experiment has worked! It is extremely twee, super pretty and not my usual style at all but I absolutely love it!!! I am not sure what to do with it now, I might be able to find a shelf to hang it on or maybe on the back of a door, or I might give it away. 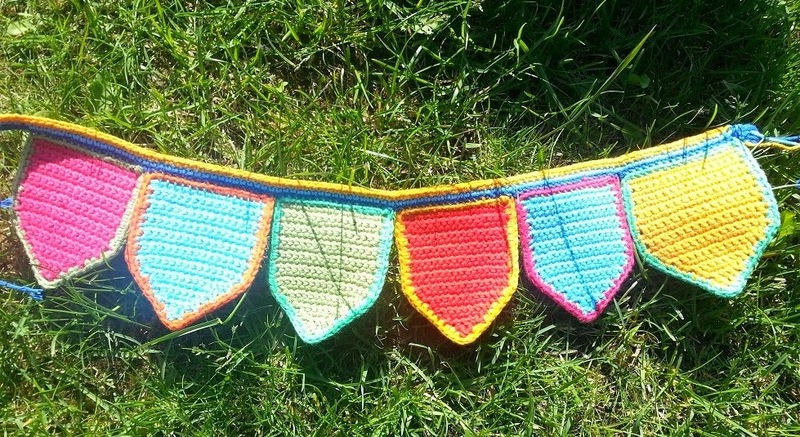 I think that is me done with this type of bunting for a while, my tension is so tight and crocheting with this yarn really makes my hand hurt so I think I need a bit of light DK acrylic to be going on with.